Thousands of teachers filled the main street of North Carolina's capital Wednesday demanding better pay. 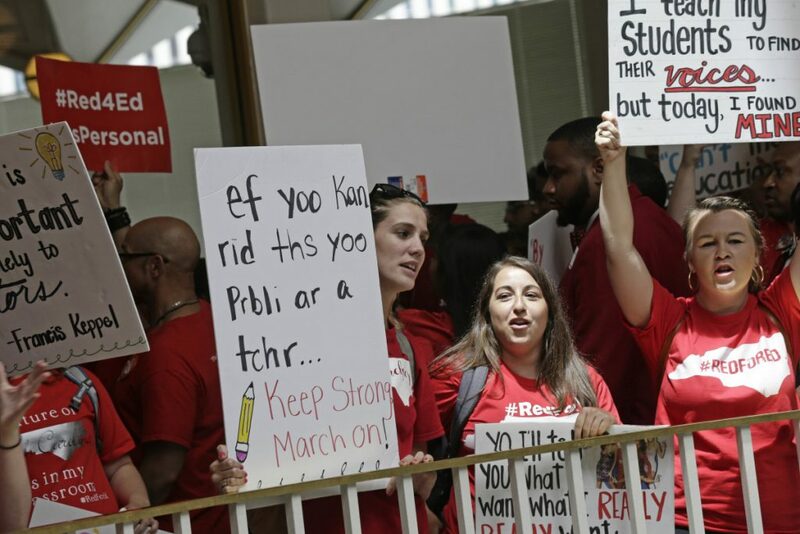 RALEIGH, N.C. — Thousands of teachers filled the main street of North Carolina’s capital Wednesday demanding better pay and more funding for public schools, hoping to achieve what other educators around the country accomplished by pressuring lawmakers for change. City blocks turned red, the color of shirts worn by marchers chanting “We care! We vote!” and “This is What Democracy Looks Like!” An estimated 19,000 people joined the march, according to the Downtown Raleigh Alliance, which based its number in part on aerial photos. Many teachers entered the Legislative Building, continuing to chant as the Republican-controlled legislature held short floor meetings to start its annual work session. Most teachers quieted down when asked, but a woman who yelled, “Education is a Right: That is why we have to fight,” was among four escorted from the Senate gallery. No arrests were made. Previous strikes, walkouts and protests in West Virginia, Arizona, Kentucky, Colorado and Oklahoma led legislators in each state to improve pay, benefits or overall school funding. Wednesday’s march in North Carolina prompted more than three-dozen school districts that educate more than two-thirds of the state’s 1.5 million public school students to cancel class. But these Republican leaders appear determined not to change course under pressure, and North Carolina educators aren’t unionized, so they have fewer options for organized protest than teachers in some of these other states. Some, in fact, had to seek personal days off Wednesday and pay $50 for a substitute before districts canceled class.